Moving on from last year’s and our theme of “letting go” to be able to renew and “letting in” again, these workshops may be right for you! If you happen to be near Cape Town in South Africa this March, and would like to visit the beautiful wine country of Stellenbosch, come and join us. Letting go was covered a little in the last newsletter. We also need to let go of old beliefs, no longer useful thoughts that we hang on to, to make room for the new and ‘letting in’ again. This requires trust. To trust ourselves and others, we must also trust our own boundaries when others might challenge or invade them. Our boundaries can be transgressed on many different levels: physical, emotional, mental/intellectual, and spiritual, and this can be understood in different ways. 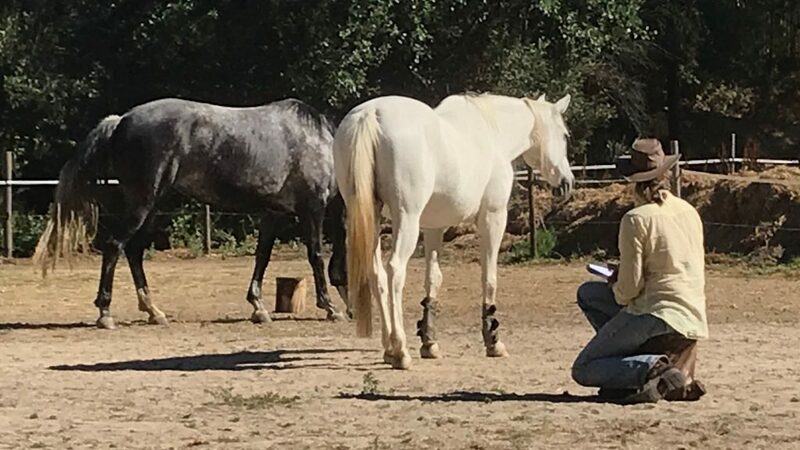 Understanding them on the most basic physical level with the horses can be a helpful metaphor to understand what it means to have boundaries on the other levels. Horses often like to challenge our boundaries, especially if they sense that they are not strong enough in a person. 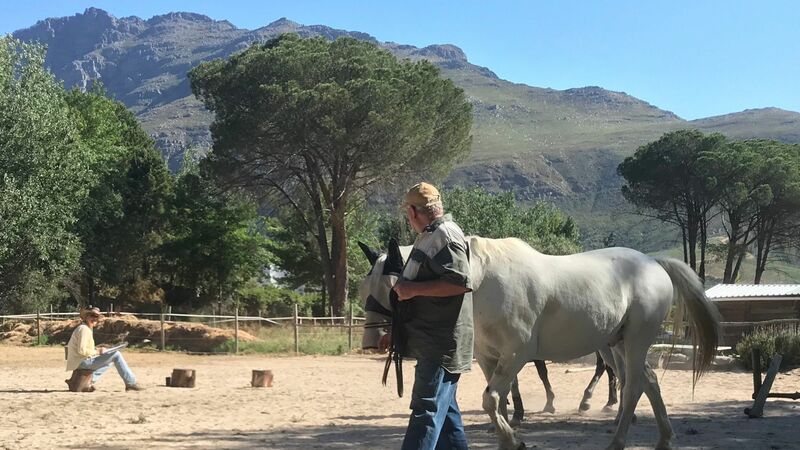 This time, in South Africa, we have designed the workshops around these themes, ready for the New Year and the new goals and challenges you may have that lie ahead in 2019. If you have any questions please do let us know (see below). What might be important for me to still ‘let go’ of this year? What would I like to ‘let in’ this year? What boundaries might I need to put into place or loosen instead and why (what are my fears)? Do I trust myself with my own boundaries and can I therefore trust others? …and Sauerkraut. This is the motto of one of the hoodies that I borrowed from one of my colleagues and dear friends, that I can’t seem to let go of. I love that hoody. This picture was taken at a recent workshop with colleagues. The motto resonates with our theme, since if we do not start with accepting and loving ourselves, it will be hard to set adequate boundaries. Having healthy boundaries is also difficult when we don’t know what we want (or don’t want). Trying things out for size can be useful, however, we need to know our own personal core values, our ‘negotiables’ and ‘non-negotiables’, to understand if saying ‘no’ or ‘yes’ to something is aligned with them. If we give space to something that isn’t, it will eventually feel like a boundary transgression. For healthy boundaries we must also develop trust. In relationships, for example, not just trusting that the person opposite us means us well (as opposed to mistrusting). 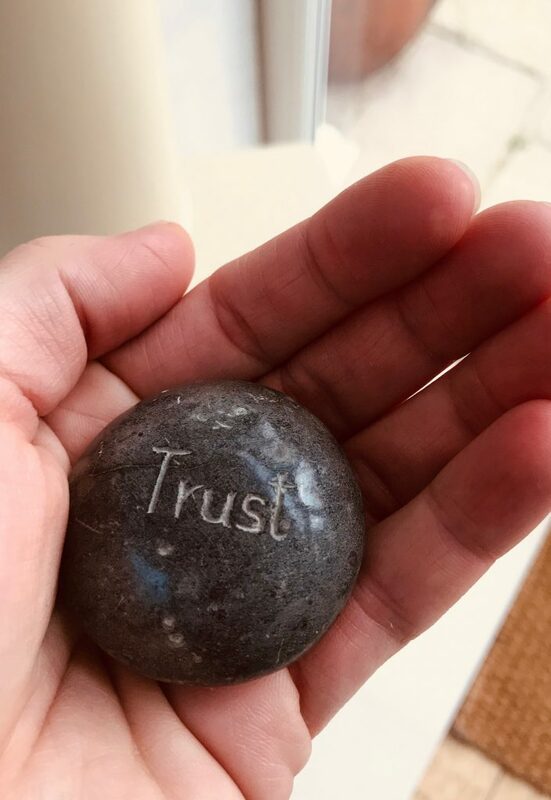 It is also trusting that no matter what the other’s intentions, known or not known to us, that we have the power and choice to fasten or loosen our boundaries as appropriate. That we can be intimate and boundaried – both at the same time. 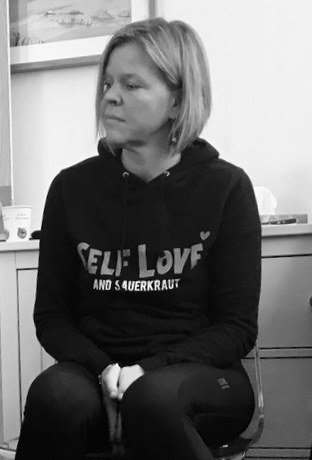 Getting to ‘know ourselves’ (personal and core values) and learning to love and accept ourselves are understandably important aspects around this work on boundaries and trust. Boundaries should not be as loose as sieves and they don’t have to be protective barriers of three miles of unbreakable walls. Understanding what boundaries even mean is a first step. Learning about our core values, having the ability to listen to our intuition and gut reactions will inform us. We can then make decisions to say ‘yes’ or ‘no’, and ‘let go of’ certain things that no longer serve us, or to ‘let in’ those new things that will be good for our soul. Which boundaries would you like to make healthier? For more information on the workshops coming up at the beginning of March this year, please click here. 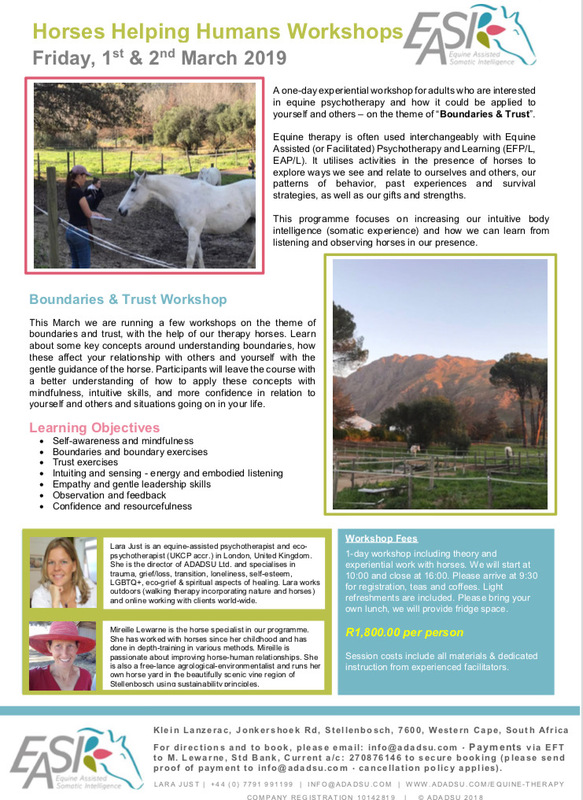 The first two workshops on the 1st and 2nd of March are about Boundaries & Trust. The third workshop, preliminary planned for the 8th March will be on the theme of Dreams and our Connection to Nature – STAY TUNED! 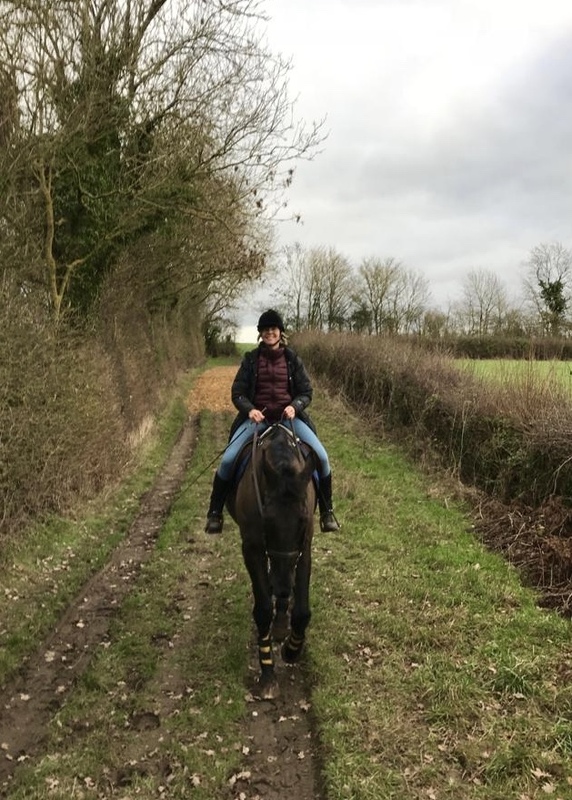 This entry was posted in Eco-Therapy, Equine-Assisted Psychotherapy, Horse therapy, horses, Psychotherapy, South Africa on 28th January 2019 by lara.